How Much Can You Make in a Nutritional Sciences Career? What Courses Can be Taken for an Online Nutritional Sciences Degree? Nutritional science studies the intersection between food, diet, and optimal health. As an aging population requires more dietary care, the demand for nutritionists is expected to increase. The Bureau of Labor Statistics projects jobs for dietitians and nutritionists to grow 15% by 2026, which is significantly faster than the national average of 7% for all jobs. Dietitians and nutritionists typically need a bachelor’s degree in nutritional sciences or a related field to gain licensure and practice in their state. Coursework in a bachelor’s in nutritional sciences program typically includes nutrition education, biology, physiology, and food science and safety. 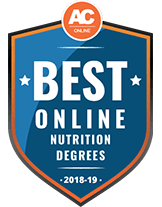 This guide presents the best online bachelor’s degrees in nutritional science and provides insight into post-graduation career options, program curricula, and financial aid opportunities. The following list ranks the best online bachelor’s degrees in nutritional sciences. We established these rankings based on key indicators, including graduation rates, tuition costs, and the availability of online courses. These indicators are based on data from the Integrated Postsecondary Education Data System. Students with an online nutrition degree enjoy a variety of expanding and potentially lucrative career paths. The following table outlines average salaries and projected job growth in popular nutritional sciences careers. 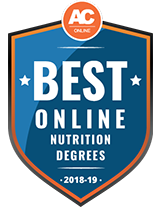 An online nutrition degree teaches students much of the foundational knowledge used in these positions, though earning a bachelor’s in nutritional sciences does not guarantee entry into these fields. Dietitians and nutritionists help patients live healthier lifestyles. They provide nutritional counseling, assess client health needs, and develop meal plans. A typical day may involve evaluating patient food diaries and progress and optimizing meal plans. Nutritionists may also contribute to research through articles and case studies to advance the field. Agricultural and food scientists specialize in improving agricultural products. They primarily seek to improve food safety, but they may also focus on sustainability or creating new food products or processing methods. On a given day, a food scientist may research soil or plant composition to see its effect on a particular crop, or they may travel between worksites to oversee production. Health educators work to improve the health of individuals and communities by providing education and access to resources. On a typical day, a health educator may develop and implement a strategic program to educate a particular population about a healthy diet. Health educators also advocate for better health resources in their communities. Exercise physiologists promote health in their patients by developing exercise programs that aid recovery from injuries or chronic diseases. While focused on fitness, exercise physiologists benefit from understanding nutrition and diet as key components of a healthy lifestyle and rehabilitation program. Much of this professional’s day is spent educating clients and prescribing exercise regimens. Fitness trainers and instructors work with people of all ages and skill levels to improve their cardiovascular health, strength, and flexibility. A trainer may work in a fitness club or at a studio, leading classes or working with clients individually. As trainers promote performance, an education in nutritional science may expand specialized career paths. The salaries and job growth expectations for dietitians and nutritionists vary by state and industry. Additionally, wages vary by experience, credentials, and cost of living. Some of the highest-paying states for this profession include California, Alaska, and Oregon, while the highest-paying industries include animal food manufacturing and outpatient care centers. The following list shows salaries and job growth data for dietitians and nutritionists by state. Students pursuing an online nutrition degree study various health-related topics, including chemistry, biology, and food science. The following list highlights common courses in a bachelor’s in nutritional sciences program. Program requirements and course offerings vary by school, so students should research each prospective school’s curriculum and degree requirements. This class examines how nutrition requirements vary as humans age. Learners analyze how diet and nutrition contribute to growth and development in children, as well as how to promote nutritional health as humans age. This science course covers basic and advanced concepts in physiology, including the nutritional needs of individual cells and how they function. Students learn how cells build health and contribute to the removal of body toxins. Starting with human origins and the diets humans evolved to eat, this class traces the development of nutrition and dietary disease through the modern day. Students also examine cross-cultural case studies. This class teaches students about the food system and its factors that affect health, sustainability, and quality. The course covers topics in food contamination, allergens, and government regulations. Especially important for nutritionists in hospital settings, this course covers nutrition principles and how they apply to disease. Learners study medical nutrition therapy, nutrition communication, and the effects of illness on the body’s ability to absorb nutrients. You should consider several factors when selecting a nutritional sciences bachelor’s degree online, including cost, accreditation status, degree offerings, and prerequisites. You should also consider the school’s reputation, the strength of its alumni network, and the department’s professors. Below are answers to common questions about earning an online nutrition degree. How Is Earning This Degree Online Different Than Earning It on Campus? Online and on-campus programs cover the same coursework with the same standards, resulting in equivalent degrees; however, the experience differs. Online learners work independently and remotely, providing flexibility for working professionals and students who want to attend a program outside of their resident state. Earning a bachelor’s in nutritional sciences prepares students for many entry-level professions. Some programs lead to registered dietician credentialing, launching graduates directly into a career. Pursuing this degree also helps students hone in on their interest areas and the types of jobs they want to pursue upon graduation. Should I Look for a Specific Degree Focus or Concentration? If you know what field you want to pursue, then select a program with a concentration that caters to your goals. Potential concentrations include health education, health communication, human environmental sciences, and food studies. If you’re unclear about what field you want to pursue, select a program with ample elective offerings and a general curriculum. What Strategies Should I Follow in Choosing My Nutritional Science Courses? Review prospective programs’ course catalogs, determining core coursework requirements and elective offerings. You can use elective coursework to expand your knowledge and learn more about your desired career path. For example, if you know you want to work in fitness, select a program with courses that cover exercise science and physiology. Application requirements vary by school. Most programs require a high school diploma, transcripts, letters of recommendation, and SAT or ACT scores. Some schools ask students to complete prerequisites in subjects like chemistry and microbiology to prepare for the science-heavy curriculum. Several programs exist for learners with an associate or bachelor’s degree. Check with each school to determine specific requirements. Several options exist to help learners finance their education. Scholarships and grants are ideal options because they do not need to be repaid, unlike federal and private loans. The following list features scholarships that help nutritional science students pay for their degree. The American Association of Cereal Chemists International offers a $1,000 scholarship to outstanding undergraduate students pursuing a career in grain-based food science and technology. Applicants must be AACCI members with a minimum 3.0 GPA who are entering their senior year. The applicant’s school must conduct research on grain-based food science. The Asparagus Club Scholarship is awarded to 10 students per year who are earning degrees in food management or food sciences and wish to enter the retail grocery industry as manufacturers, executives, advisers, or retailers. Juniors and seniors can apply for the $2,000 award if they maintain a minimum 2.5 GPA and full-time enrollment status. The Certified Angus Beef Colvin Scholarship Fund splits $26,000 between five undergraduate students. Applicants must study nutrition and food science, animal science, or sustainable food production and possess dedication to the beef industry and high-quality production processes and products. Applicants must submit two essays, transcripts, and two letters of recommendation. Awards are based on academic achievement, communication skills, career goals, and previous industry-related activities and research. The Cook Something Scholarship offered by Macheesmo is a $500 scholarship awarded to one individual per year who shows passion for pursuing a food-related career. Any U.S. student enrolled or planning to enroll in a food-related course of study, such as nutritional sciences, can apply. The application requires one essay on why the applicant wants to study nutrition and one on their favorite dish and why it is meaningful to them. Offered through the North American Meat Institute (NAMI), this scholarship recognizes exceptional undergraduate students studying animal, meat, or food and nutritional sciences. NAMI awards its merit-based $2,500 scholarship to students pursuing a career in the meat industry. Applicants need a minimum 2.75 GPA and must submit transcripts, letters of recommendation, a list of extracurricular activities, and an essay demonstrating their career goals.